Tim Duncan: Is he the greatest post-Jordan/pre-LeBron player in the NBA? I prefer the NBA over other sports and I usually invest more time into watching and reading about it than other sports. I also play basketball more than I play other sports. That said, I’m not one to get knee deep in statistical analysis or have a wealth of knowledge on the sport from the nuances to the history. That said, I still find it fun to talk about the “greatest” to have played the sport. 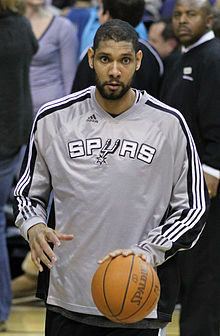 With that in mind, Bill Simmons today put out a Part 1 and a Part 2 about Tim Duncan’s sixteen-year career with the San Antonio Spurs starting in 1997 through to the present. Tim Duncan is scarily durable and reliable when you look at his career arc, as outlined by Simmons. He’s consistently awesome and that reflects in the success of his team over the years too. Normally, I would have Kobe Bryant in that post-Jordan/pre-LeBron position as the best of his generation. However, Simmons case is quite convincing that the spot rightly belongs to Tim Duncan. As he said though, much of that revolves around whether Duncan and the Spurs can get through Miami in the Finals and claim another title. We’ll see.